OMG perfect mirror- high quality great color to flow with lots of décor and again love me some Overstock. Another thing we loved was the metal brackets for hanging and the stability since it is a heavy mirror over our bed! Nothing cheap about this puppy. 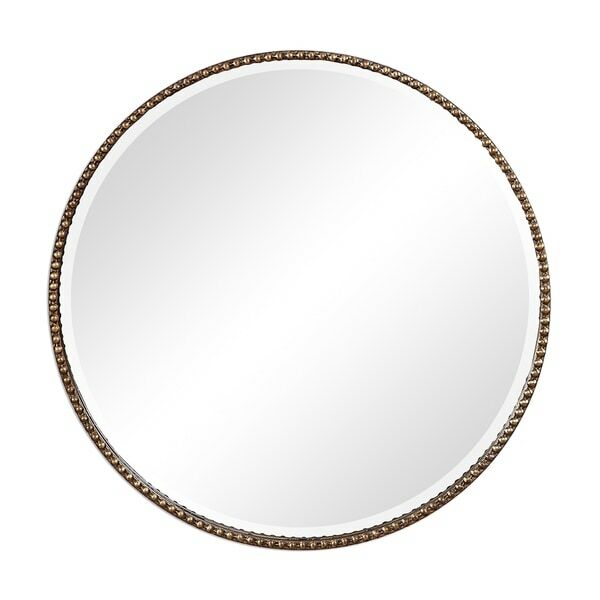 This round, metal frame features a beaded design finished in a heavily antiqued gold hue. Mirror has a 1.25-inch bevel. Dimensions 34.0 In. X 2.75 In. X 34.0 In. Absolutely beautiful beveled mirror. Unfortunately it is too large over my small fireplace and I will return it. Very pleased with service and product.